Swami Dayanand Saraswati was born on February 12th, 1824 in Tankara, Gujarat in a Brahmin family. His parents, Lalji Tiwari and Yashodhabai were orthodox Brahmin. He was a self-taught man and a great leader of India leaving a significant impact on the Indian society. During his life, he made a prominent name for himself and was known among a wide array of Princes and the public. He was against Idol worship and considered it as pointless. He supported the idea of women empowerment and condemned all the misconceptions which did not allow women access to the Vedas. He brought about a radical change in the educational system of that time by establishing Anglo Vedic Schools in which the Indian students were taught about the Vedas along with English education. He was never directly involved in the political scenario of the country at that time but his views and opinions inspired a lot of political leaders to strive for India's Independence. He was given the title of Maharshi and was thought of as one of the makers of modern India. His real name was Mool Shankar and his family was a strong follower of Lord Shiva. His family was extremely religious and Mool Shankar was taught all about piousness and purity with the importance of fasting right from the beginning. The ritual of Yajnopavita Sanskara was performed on Mool Shankar when he was 8 years old. Yagnopavita means the twice-born ritual which is performed to introduce a child into the world of Brahmanism. From a very early age he observed and performed usual Brahmin rituals with much intent and honesty for example on Shivratri, he used to stay awake for the whole night to honour Lord Shiva. On one such Shivratri, he witnessed a mouse eating the offerings of Lord Shiva and then the mouse started to move on the idol. This made him realise that if God cannot even defend himself against a tiny mouse, then how can he defend the whole world. When Mool Shankar was 14 years old, his sister died which made him question death and the afterlife. It was evident that his parents had no answers. When he was old enough and his parents pressured him to get married according to societal rituals, he decided to run away from home and for the next 20 years, he visited the temples all over the country. He met with the Yogis who lived in the mountains and told them about his dilemma over Idol worship and his questions about life and death. Even they could not answer him to his satisfaction and he moved to Mathura where he met Swami Virajananda. Mool Shankar became his disciple and Swami Virajananda pointed him towards the Vedas. In the Vedas, he finally got his answers regarding life, death and afterlife and hence was trusted by Swami Virajananda to spread the knowledge of the Vedas throughout the society. He even christened him as Rishi Dayanand. As far as Swami Dayanand Saraswati’s spiritual beliefs go, he believed in Hinduism, according to the guidelines which have been outlined in the Vedas. He believed that Hinduism has been corrupted over the years and the pure form of the Hindu religion rested in the Vedas. He made efforts to preserve the purity of the faith in Vedas and advocated Dharma. According to him, Dharma was anything that is written in the Vedas and works in favour of the Indian society. Adharma was anything that wasn’t outlined in the Vedas and did not work for welfare of the general public. He believed in the importance of life, irrespective of anything else and supported the concept of Ahimsha or nonviolence. In his preaching, he asked his followers not to waste their energy and resources in performing useless rituals and instead use them for the betterment of lives of fellow countryman as a whole. He condemned the practice of Idol worship and depicted them as a corruption which was introduced by the priest community to fulfil their own benefits. He also spoke against other prominent social evils at that time like division of the society based on caste. He supported the concept of Swaraj which means the country to be free of any foreign influence. The views of Swami Dayanand Saraswati inspired a lot of future Indian leaders who fought for the independence of the country. Swami Dayanand established the Arya Samaj on 7 April 1875 in Bombay. It was established with the sole purpose to reform the Hindu religion and rid it of any corruption. Meaning of Arya Samaj is Society of the nobles. The motto of this organisation was ‘Krinvan to Vishwam Aryam’ meaning make this work Nobel. 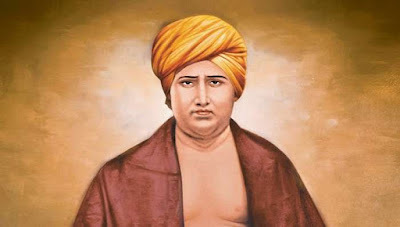 Maharshi Dayanand introduced the Shuddhi movement in order to bring back the Hindu individuals who had converted to other religion like Islam and Christianity either voluntarily or involuntarily. The Arya Samaj imparted Shuddhi or purification to people who wanted to come back to Hinduism and the Arya Samaj did an excellent job by penetrating different levels of the society. Maharshi Dayanand realised that the cause of corruption in the Hindu religion was the lack of knowledge. He established a number of Gurukuls in which he taught the students about the Vedas and encouraged them to spread this knowledge further. The students were so inspired by Dayanand’s beliefs, his teachings and his ideas that they established the Dayanand Anglo Vedic College Trust and Management society after his death in 1883. The first Dayanand Anglo Vedic High School was founded on 1st June 1886 whose headmaster was Lala Hansraj. Views and beliefs of Swami Dayanand Saraswati were firmly radical at that point which condemned the most prominent social issues and practices of contemporary times which earned him a lot of enemies. In October 1883, on the occasion of Diwali, Jaswant Singh II, who was the Maharaja of Jodhpur at that time, invited Maharshi Dayanand to his palace to seek his blessings. Dayanand offended the court dancer by giving the king advice to get rid of her and follow the life of Dharma. The court dancer conspired with the royal cook and mixed pieces of glass in Dayanand’s milk. He suffered extreme pain but before he succumbed to death, he forgave the coke and everyone involved. He died on October 30, 1883 at Ajmer. The Arya Samaj founded by him is still very active even in other countries like the United States of America, Canada, Trinidad, Mexico, United Kingdom, Netherlands etcetera. He was never directly involved in any politics but his teachings had significant influence in several prominent personalities which include Ram Prasad Bismil, Subhash Chandra Bose, Shaheed Bhagat Singh and Lala Lajpat Rai. Bhagat Singh was even educated at the Dayanand Anglo Vedic School in Lahore. To quote the famous American spiritualist, Andrew Jackson Davis, Swami Dayanand was a “son of god”.